Answer: More lawlessness means mostly that religious leaders, pastors, and elders go against God’s will, and go their own way. They don’t obey God’s commandments, misinterpret the Bible to shackle, control, and deceive people, drowning them in biblical theology, taking them further away from God, turning churches into places of religious ritual, and they treat their responsibilities and duties as access to status and job, which leads to many hypocritical acts that resist God in the church. Many people have exposed their unbelieving viewpoints. They pursue worldly pleasures, depart from the way of the Lord, and even treat God’s words as mere myth. They do not believe at all that the Lord Jesus will come again to speak and do work. Especially religious leaders without any fear of God in their hearts, and all kinds of evil men and unbelievers who do not love the truth are exposed, openly committing evil acts, denying God’s work of the last days, and rejecting the truth. Those religious pastors and elders primarily preach biblical knowledge and theology. They strive to protect their own status, influence and income, but they refuse to follow the Lord’s way or spread the Lord’s word. They don’t exalt or testify the Lord at all. Instead, they preach things that betray the truth in God’s word, using traditions to deceive and control people, stubbornly taking the Pharisees’ path of resistance to God. Many religious pastors and elders also pursue worldly pleasures. They seek fashion, lust for money, and struggle for position. They are purely men of the world, purely unbelievers. Infuriating is that these religious leaders, pastors and elders wildly condemn God’s work in the last days to deceive and control the believers. They even collude with the CCP, standing with Satan against God, striving to create their own kingdoms, and re-crucifying God, for which God hates and curses them. These lawless acts are facts apparent to us all. They are nothing less than a betrayal from the religious world. Because of the increase in lawless acts, the faith and love of many believers has gone cold, and they are negative and weak. Because these religious leaders have chosen their own path and no longer follow God’s way, the work of the Holy Spirit has been withdrawn and the religious venues have been abandoned. The Holy Spirit’s work has moved to those who accept Almighty God’s work of the last days. These things reveal that God’s righteous disposition is intolerant of offense by man. We just fellowshiped on some of the reasons the religious world is desolate. Now, I’d like to add my own perspective and opinion to the root causes of the desolation in the religious world. Let’s read two passages from Almighty God, which will help you better understand the causes of desolation in religion. Almighty God says, “God will accomplish this fact—everyone in the universe will come to meet God, worship God who is on earth. God’s work elsewhere will stop, man will be forced to seek the true way. Just as everyone went to Joseph to get food and bowed down to him because he had food. To escape from famine, people will have to seek the true way. The whole religious world will suffer from a serious famine. Only today’s God is the fountain of living waters, providing an endless source of water for people’s enjoyment. People will come and rely on Him” (“The Millennial Kingdom Has Come” in The Word Appears in the Flesh). “God’s work in the entire universe has focused on this group of people. He has devoted all His efforts to you and sacrificed all for you; He has reclaimed and given to you all the work of the Spirit throughout the universe. That is why I say, you are the fortunate” (“Is the Work of God So Simple as Man Imagines?” in The Word Appears in the Flesh). Almighty God’s word has clarified the cause of the famine in the religious world. This allows us to see the omnipotence and wisdom of God. God has not abandoned those who love the truth and thirst for His appearance. God has used the famine’s arrival to compel people to seek the true way, making them find His will and His footsteps amidst the desolation in the churches. He did this to help those in every denomination who love the truth and truly believe in God to come before His throne. So God says, “God’s work in the entire universe has focused on this group of people.” From this we can see that the work of the Holy Spirit has moved to those who accept God’s work in the last days. This proves the fact that God means for all those who come before His throne, to become those after God’s heart. These people will be made overcomers by God before the disaster, and so the Lord Jesus’ prophecy of the clever virgin attending the wedding feast with the Lamb will be borne out. The foolish virgins, who, no matter how desolate or dark their churches become, remain in them and wait for death, are just like the Israelites who died in the wilderness after being led out of Egypt. The whole religious world has become a place of ruin, primarily because the religious world’s leaders follow the path of the Pharisees and disobey the Lord’s will. They don’t follow God’s will, don’t obey the Lord’s commandments, and were abandoned by God long ago. 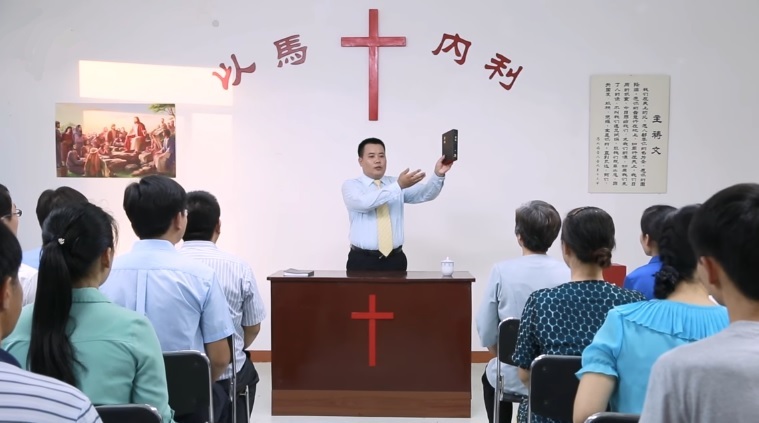 Through the truth God incarnate expresses in the last days, their antichrist nature is exposed. They become those who re-crucify God and are cursed by God. What is God’s purpose in causing the religious world to face famine? He wants people to seek the true way. Those who long to search for God’s voice, who accept Almighty God’s work of judgment in the last days, will again receive the work of the Holy Spirit, provision of the living water of life which flows from His throne, and finally be saved to enter the kingdom of heaven. These are the people the Lord Jesus prophesied, would be raptured into the kingdom of heaven. If we refuse the judgment, chastisement, purification, and salvation of Almighty God’s words, we will be eternally abandoned and eliminated. As Almighty God says, “if you oppose Christ of the last days, and deny Him, then there is no one who can bear the consequences on your behalf. Furthermore, from this day onward you will not have another chance to gain the approval of God; even if you try to redeem yourself, you will never again behold the face of God. For what you oppose is not a man, what you deny is not some puny being, but Christ. Are you aware of this consequence? You have not made a small mistake, but committed a heinous crime. And so I advise everyone not to bare your fangs before the truth, or make careless criticisms, for only the truth can bring you life, and nothing except the truth can allow you to be reborn and behold the face of God” (“Only Christ of the Last Days Can Give Man the Way of Eternal Life” in The Word Appears in the Flesh). To recover a normal relationship with God, I searched everywhere for a church with the presence of God. But all denominations and sects I saw were as desolate as my own. One day, I talked about it with my former classmate. Form her fellowship, I found the way to solve the desolation of churches. Question 1: For years, we feel an emptiness in our church. We’ve lost the faith and love we had at the start, and become weaker and negative. The preachers sometimes feel lost and don’t know what to talk about. We feel we’ve lost the work of the Holy Spirit. We’ve..
She took an active part in the church affairs after believing in the Lord, but found that the Choir and the memorial ceremony of the Passion of the Lord became money makers of the church. To their surprise, she and other believers found the church was no longer a place to worship the Lord.